Craving some sweet, rich and crispy waffles? 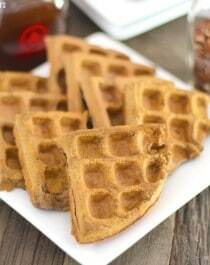 Make these Healthy Pumpkin Buckwheat Waffles! They’re sugar free, low fat, high fiber, high protein, gluten free, AND vegan (!!! ), but they sure don’t taste like it. Whether you like pumpkin or hate it completely, you’re gonna love these waffles. Becaaauusee, I don’t even like pumpkin and I ate these waffles like a rabid animal. These are SO. GOOD. These are the best waffles to make if you’re trying to get more whole grains, fiber, and protein in your diet. Each waffle has 15g of filling fiber and 11g of complete protein, with only 4.5g of healthy fats and 250 scrumptious calories! 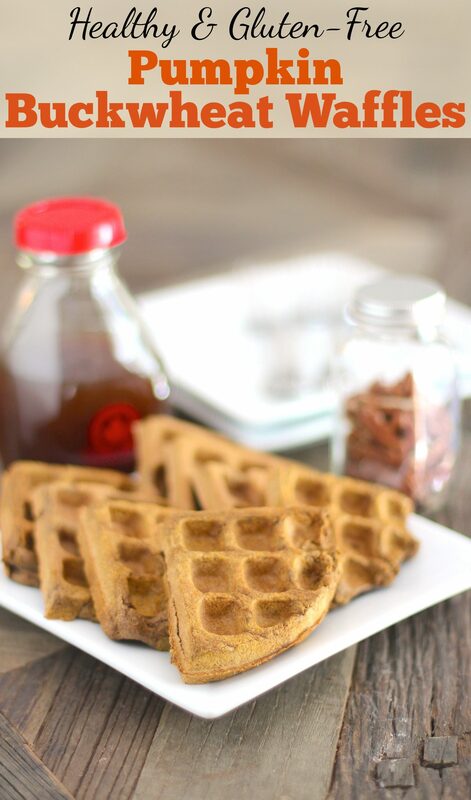 Healthy Pumpkin Buckwheat Waffles — it’s what’s for breakfast. Craving some sweet, rich and crispy waffles? 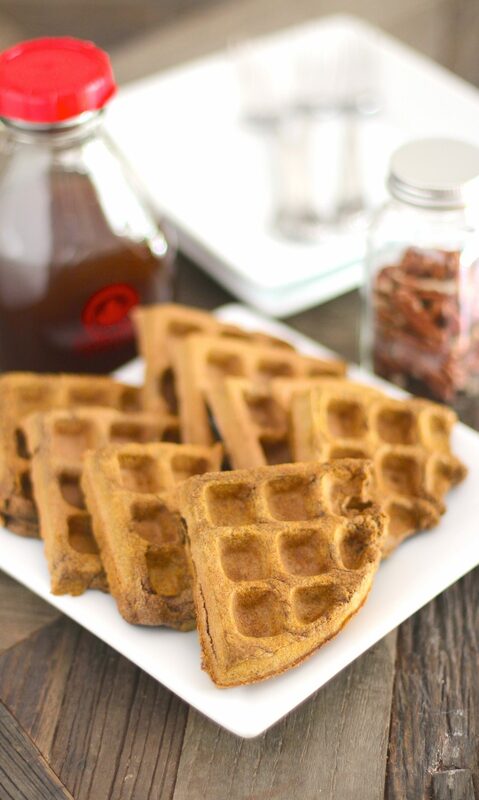 Make these Healthy Pumpkin Buckwheat Waffles! They're sugar free, low fat, high fiber, high protein, gluten free, AND vegan, but they sure don't taste like it. In a small bowl, whisk together the buckwheat flour, baking powder, cinnamon, apple pie spice and salt. In a large bowl, whisk together the coconut milk, pumpkin and stevia. Dump the dry over the wet and whisk together. Preheat your waffle iron to medium heat and spray with cooking spray. When the iron is hot, scoop in ⅓ of the batter and cook until firm. Repeat this step until the batter is used up. Serve with pure maple syrup, homemade maple syrup, pumpkin spice syrup, nut butters, and/or fresh fruit. Enjoy! Mmmm, healthy and nutritionally balanced, yet sinful tasting, waffles! 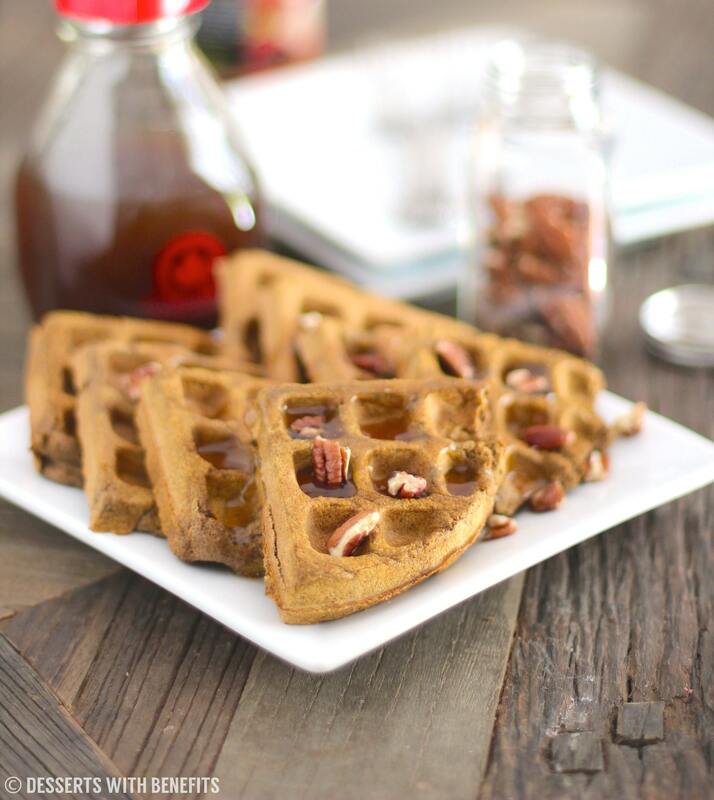 With a drizzle of pure maple syrup and a sprinkle of chopped pecans, these Pumpkin Buckwheat Waffles are THE best (and most delicious) way to start your day. Thanks! I can’t believe Ireland isn’t pumpkin-crazy like the US (people go INSANE for pumpkin here… it’s already selling out at grocery stores). Pumpkin Carrot Cake sounds amazing, that’s such a good idea. I just made a Carrot Cake but I used applesauce… I wonder how that would work with pumpkin instead! Looks yummy! yay for pumpkin season – I think I might try these with oat flour instead of buckwheat. Do you think that would work OK? I think I tried these waffles with oat flour and it didn’t work out too well. They weren’t crispy, they were more like pancakes just in the form of waffles. They were also a bit difficult to get out of the waffle maker. I mean, they tasted good but the texture was just off. I love having waffles for breakfast.. but usually they are a rarity as waffles are often so unhealthy so I love your healthy recipe and I definitely will be making it! Can I live in your kitchen? Super delicious waffles with a bit of sugar added instead. Thanks so much for this single flour recipe!